The scientists assessed a muscular pump in the worm Caenorhabditis elegans. The pharynx utilizes homologues of most of the ion channels, pumps and transporters defining human cardiac physiology. To yield precise rhythmicity, the team optically paced the pharynx using channelrhodopsin-2. They assessed pharynx pumping by extracellular recordings (electropharyngeograms or EPGs) as well as by a novel video-microscopy based method, which allows analyzing multiple animals simultaneously. Mutations in the L-type voltage-gated Ca2+-channel EGL-19 caused prolonged pump duration, as found for analogous mutations in the Cav1.2 channel, associated with long QT syndrome. egl-19 mutations affected the ability to pump at high frequency and induced arrhythmicity. The pharyngeal neurons did not influence these effects. The team tested whether drugs could ameliorate arrhythmia in the optogenetically paced pharynx. The dihydropyridine analog Nemadipine A prolonged pump duration in the wildtype, and reduced or prolonged pump duration of distinct egl-19 alleles, thus indicating allele-specific effects. The figure shows that the pharynx of an optogenetically modified worm reliably reacts to different "commando" frequences (labelled blue). 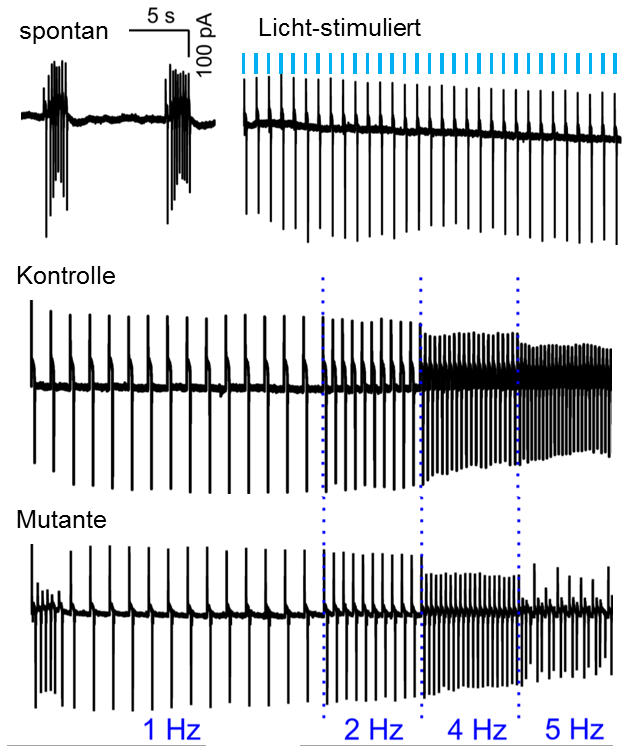 The control (Kontrolle) shows the pumping pattern of the pharynx of a normal worm. The last pattern below shows the reaction of a worm, which has a defect calcium channel. It demonstrates clearly that the pumping in this diseased worm becomes irregular at high frequencies.